Download free printable fish valentines for kids. Your child will love passing these valentine cards out to friends at the school Valentine’s Day party. Does your child need cute (and free!) valentine cards to give to friends at the school this year? Today, we’re sharing Free Printable Fish Valentines we designed for kids. I just updated this post with allergy-friendly Valentine’s treats ideas to go into the bags. These are the best last-minute DIY Valentine’s that you can make. They are easy and all you need is a printer, a hole punch, some baggies and twist ties! For my son’s preschool class last year, we wanted to create one of a kind valentine cards or tags that could be attached to an inexpensive treat or trinket like stickers, pencils, candy or crackers. Both of my boys love fish crackers (what preschooler doesn’t, right?!) so one day as they were snacking an idea struck! 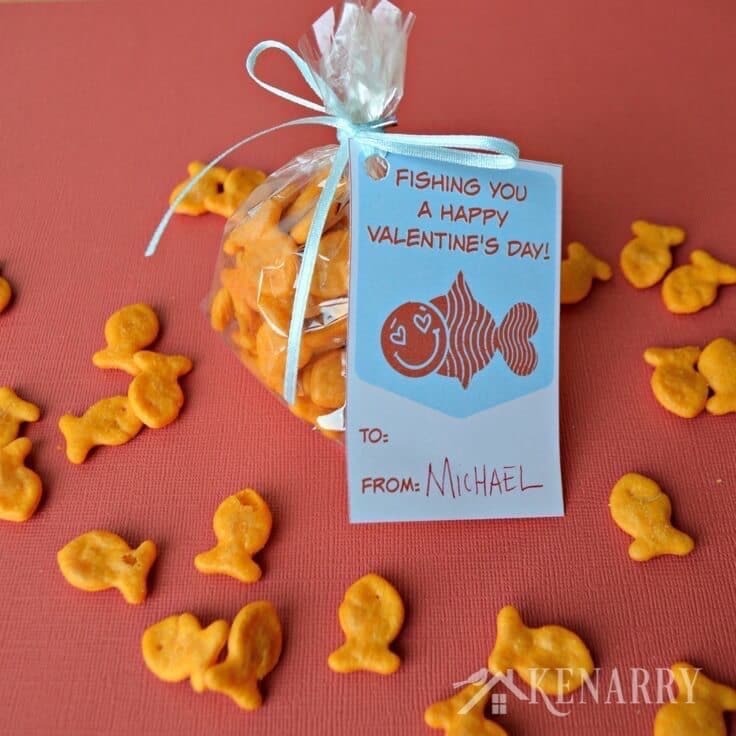 What if I made a cute little Fish Valentine to go with fish crackers? It could easily be attached to a little baggie and tied with ribbon, similar to how we made Muppet Mix for his birthday treat the previous year. My oldest son loved how the Fish Valentines turned out. It made him giggle that the card said “‘Fishing’ You a Happy Valentine’s Day” rather than ‘Wishing’. 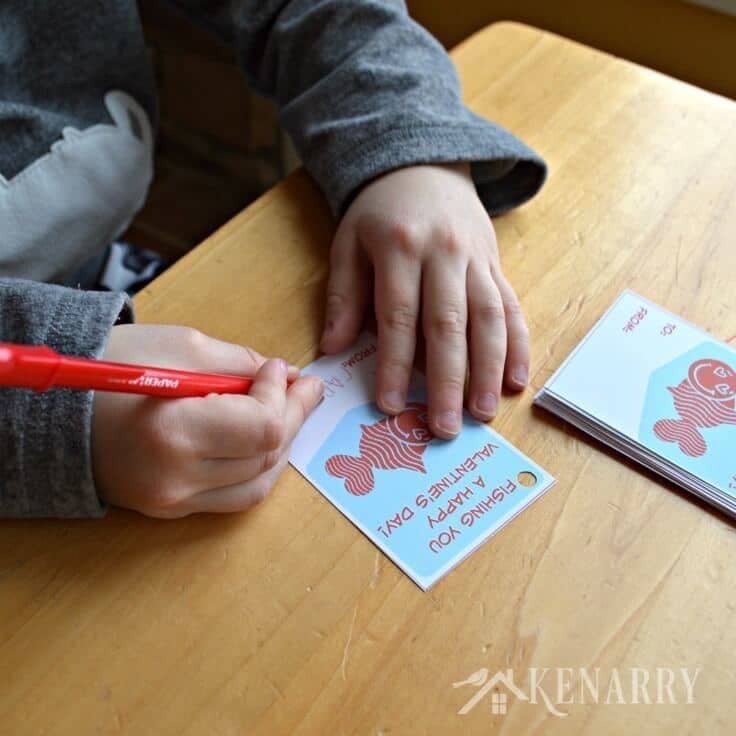 Chances are your preschool or elementary child will love them too so I wanted to make the Fish Valentines available as a FREE digital download for Kenarry Idea Insiders. Since I first wrote this post in 2016, I’ve been asked for some allergy-friendly snack ideas to put inside Valentine’s bags. Goldfish crackers are great for peanut allergies. Double check your box though, just in case they are manufactured in a place that handles peanuts. The crackers do have gluten, so if you wanted you could opt for the gluten-free fish crackers. It doesn’t take much to make these cute Fish Valentines. 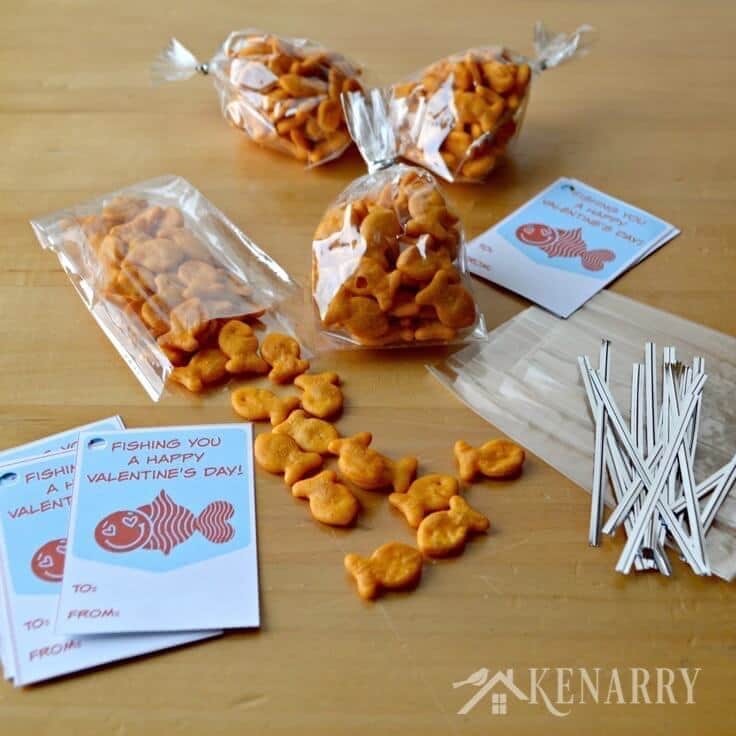 All you need are small cellophane bags, some fish treats, a little ribbon and our free printable Fish Valentines for a valentine card your child’s classmates will love. 1. Get the Free Printable Fish Valentines. The printable Fish Valentines are available as a FREE gift when you sign up below! Then you just need to download the PDF file and save it to your computer. The Fish Valentines and all other free printables from Ideas for the Home by Kenarry™ are for your own PERSONAL USE ONLY. 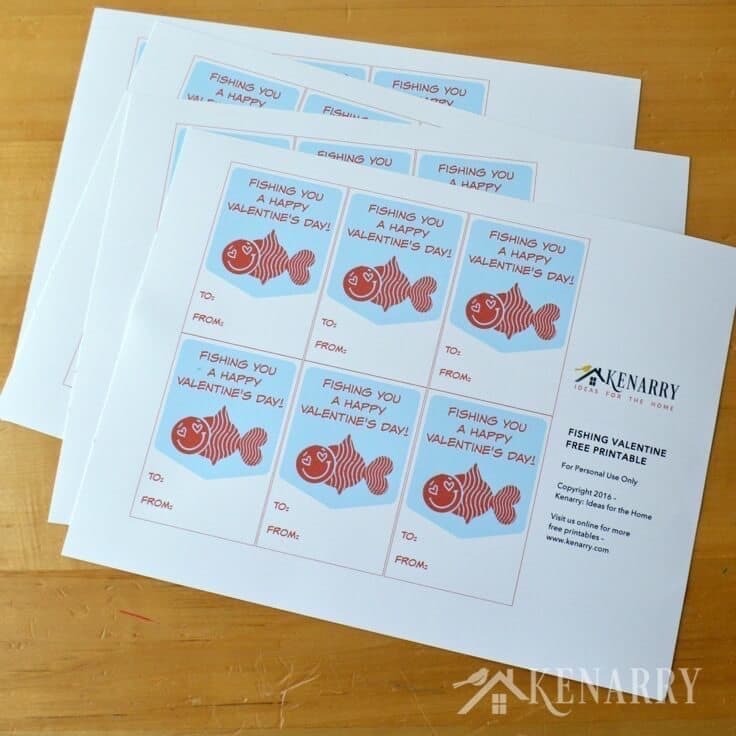 Once you have the file, print the Fish Valentines in color on white card stock. They come 6 to a page, so keep that in mind when you are printing them. 2. Cut and punch the Fish Valentines. Cut the tags apart. For straight lines, I’d suggest using a paper trimmer. It’s so fast and much easier than using scissors. Next, use a simple hole punch in the corner so you can easily tie the tags onto the cellophane bags once they are filled. 3. Sign the Fish Valentines. 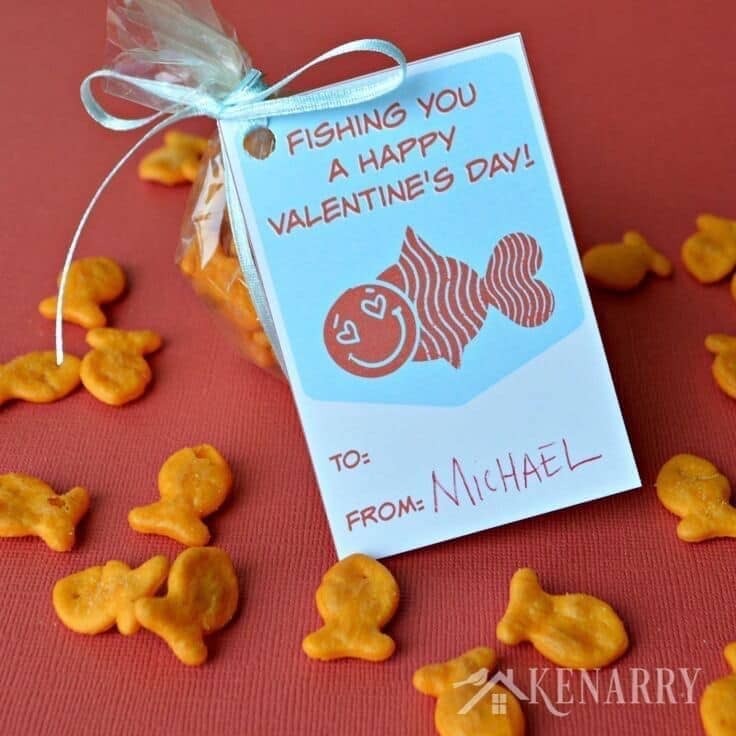 If your child is able to write, have your child spell out his or her name on the Fish Valentines. After I designed the cards, we learned my son’s preschool teacher preferred the kids not address cards to specific kids. Since the kids are just starting to learn to read, it makes the whole distribution process at the Valentine’s Day party go much faster if they can hand the valentine card to any kid. 4. Fill the treat bags. Use whatever fish shaped treats you want to fill the cellophane bags. I used standard cheddar fish crackers, but they come in a multitude of other flavors. 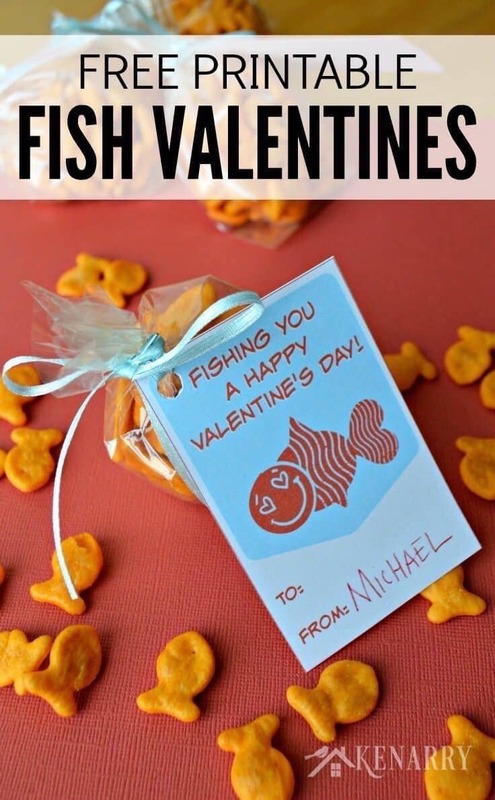 You could also use fish shaped candy, make fish sugar cookies or skip the treats all together and just give out the Fish Valentines as is. 5. Tie on the tags. Use twist ties to seal the top of each treat bag. 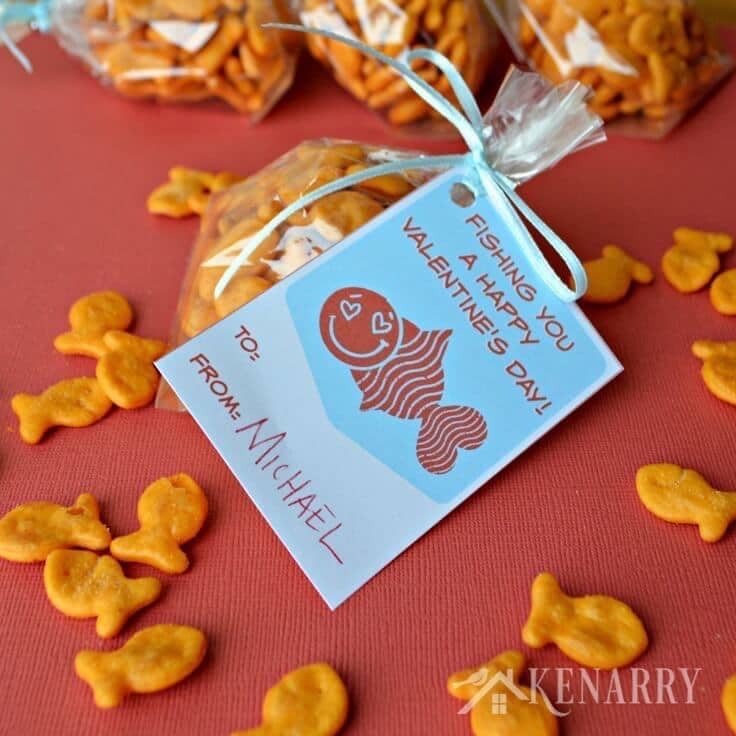 Then loop a ribbon through the Fish Valentines and tie them as tags around the top of the twist ties. Now you have a colorful and fun treat for your child to give as valentines at school! 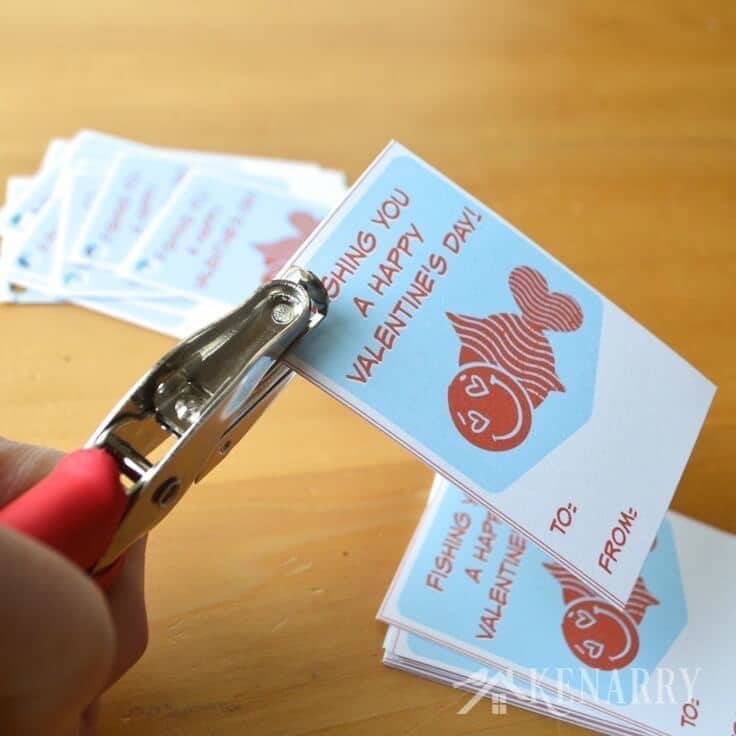 You could also cut the To/From part off of the bottom of the cards and just use the Fish Valentines as cute tags on a Valentine’s Day party favor. While you’re here, be sure to check out the Long Distance Valentine Hug Cards we made to send to the boys’ grandparents. Originally published January 2016. Updated January 2018. Pinning this for later. I might do this for my little boy’s preschool friends. Thank you so much for pinning this Charlene! If you end up making these for your son’s preschool friends, let me know. I’d love to see how yours turn out. Great idea! Pinned and tweeted to share. We appreciate you linking up and sharing with us at Snickerdoodle Sunday! It’s so sweet of you to visit, pin and tweet our post. Thank you so much, Laurie! Great DIY printable. Thanks for sharing with us at Throwback Thursday. Thanks Quinn! I’m so glad you like it. 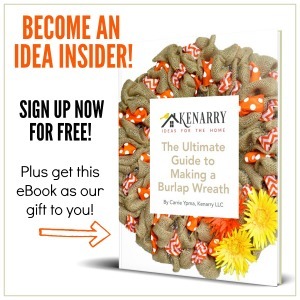 Subscribed but I did not get the free printable. Thank you so much for subscribing! As soon as you clicked the link to confirm your subscription you should have automatically sent to our Idea Insider Resource Library. I just sent you an e-mail with all the details though so should should be all set now!